Immune system is a system which protects our body from toxins, bacteria, viruses and dangerous pathogens. There are many factors which may cause weak immunity such as blood transfusion, inadequate sleep, ultraviolet radiations, exposure to chemicals, drug therapies, athletic overtraining, surgery and certain bacterial and viral infection. Some of the common symptoms of weak immunity are constant fatigue, lethargy, recurring infections, depression, frequent diarrhea, tiredness, stress, insomnia and dark circles around eyes. Weak immunity can cause all types of illness in a person. 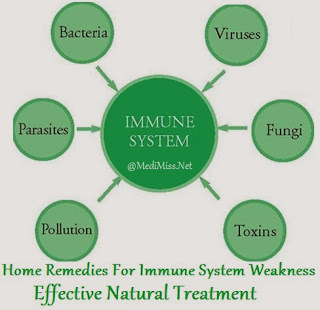 These were some of the effective home remedies for immune system weakness which are simple, safe and easy.